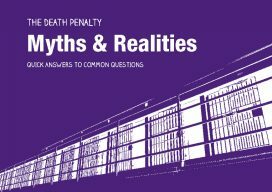 Myths and Realities provides ‘quick answers to common questions’ about the death penalty. The ‘myths’ covered, for example, include: ‘The death penalty keeps societies safer’, ‘the death penalty is applied fairly’, ‘there is nothing in international law to stop countries using the death penalty’, and ‘victims and relatives are in favour’. The booklet is interactive in format – allowing readers to read the myth and turn over a flap to discover the reality. We hope it will be a useful guide for activists and advocates of abolition, giving them the arguments they need to tackle common pre- and misconceptions.